Tiruchirapalli is situated on the River Kaveri in Tamil Nadu, southern India; it is dominated by the Rock Fort, a massive sand-coloured rock which towers to a height of over 80 metres. The rock has been the stronghold of various ruling dynasties, the Cholas, the Pavallas, the Pandyas and the Vijayanagar rulers. 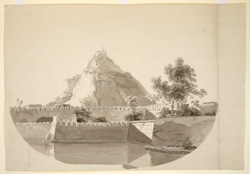 The Pallavas were the first to exploit the rock for architectural purposes, building temples in excavated cool recesses in its sides, but it was the Nayaks of Madurai who realised the site's potential as a fort, adding walls and bastions as fortifications in the seventeenth century. This firmly established Tiruchirapalli as an important trading city.